Professional signage is like a business’s signature. You want it to be unique and interesting so that your company will get noticed, especially if you’re at a trade show. It’s marketing. There are many ideas one can use to make a creative display — like retractable banners, and table top displays. Here are some ideas to help your business stand out. One item you can use is a tabletop display. This is a nice, inexpensive way to attract customers. A tabletop display can simply be a large, inviting sign or banner that informs customers about your business. It should be simple and bold (including loud colors), which’ll make your business seem elegant and straight to the point. The graphics can then easily be updated and changed to whatever fits your needs as well. 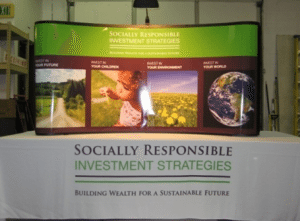 Another effective item that can be used is a trade show booth. This is a large “wall” built or erected including a lot of information about your business. This can be a very effective way to attract customers to your display, because people like something to do. If you provide that something, then customers will spend more time at your business installation, and in the meantime learn about your company. Other effective ideas to consider are retractable banners. These, like trade show booths need to be assembled; however, it is worth the time and they are easier to assemble than booths. A retractable banner is a large banner that informs customers about your company and can easily be taken down. There are many ways to increase your customer traffic. Take a look at the types of displays out there to get customers coming to your booth. Be creative, as well as original and informative. This is the best way to stand out at a trade show, and signage displays are great ways to express this.